Whenever the younger half of a brother-brother tandem is called up, the comparisons are unavoidable. Billy and Cal Ripken, Jose and Ozzie Canseco, Jason and Jeremy Giambi, and, of course, Ryan and Steve Braun. Most recently, we’ve had the combination of B.J. and Justin Upton, one of the least one-sided brother tandems in MLB history. With the Oakland Athletics’ recent call-up of 24-year-old Jemile Weeks, younger brother (by four-and-a-half years) of Milwaukee’s Rickie Weeks, we may see yet another balanced brother combination. Jemile is poised to put together a solid big-league career, but he’ll be doing it with a different approach than big brother beyond just his switch-hitting. Jemile will certainly have some work to do to equal Rickie’s performance at age 24. Rickie’s age 24 season produced 3.4 WAR for the 2007 Milwaukee Brewers, thanks to a .235/.374/.433 batting line in 506 plate appearances. As that line suggests, Rickie strikes out a ton (28% in 2007, 27% career) but evens it out with walks (15.4% in 2007, 10.6% career) and power (.198 ISO in 2007, .179 career). struck out 69 times (15% of at-bats). His power wasn’t completely negligible, either, it just usually came inside the park: Jemile recorded 20 double and 11 triples in these two stints., good for a .132 ISO. Over the past season and a third, Rickie has compiled a stunning 9.1 WAR and has positioned himself as a perennial All-Star second baseman. Jemile has a ton of work in front of him to equal his older brother, as it remains to be seen if his contact-central game can fully translate to the big leagues. If it can, big brother may have some company at the All-Star Game in the near future. We hoped you liked reading Weeks Files: Jemile Is Not Rickie by Jack Moore! 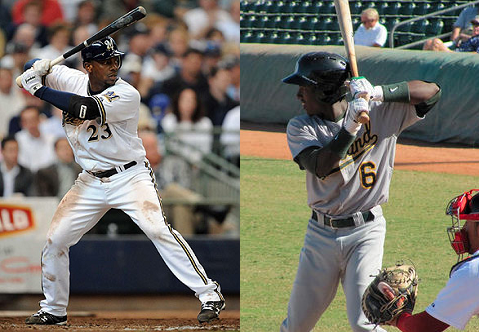 As an A’s fan, I was surprised at the selection of Jemile Weeks as a first rounder. One of the theories of Moneyball was that players could develope power, but were less likely to develope plate discipline. Look where they are now.